MALAYSIA Building Society Bhd, having finally secured an Islamic banking licence by acquiring Asian Finance Bank Bhd (AFB) in a RM644.95 million deal, is expected to kick off its new banking entity in the second quarter of next year with RM42 billion in Islamic assets, says MBSB president and CEO Datuk Seri Ahmad Zaini Othman. “On Legal Day One, the banking entity is expected to have about RM42 billion of Islamic assets, with more to come later, after MBSB converts all its conventional loans to Islamic and transfers them to the entity,” he tells The Edge in a brief phone interview. To put things in perspective, MBSB’s banking subsidiary will be the country’s second largest standalone Islamic lender after Bank Islam Malaysia Bhd, which had assets of RM54.25 billion as at June 30. The deal, which was unveiled last Monday, is structured such that post-merger, MBSB will continue to be the listed holding entity, while AFB — which will be rebranded — will be the wholly-owned subsidiary that runs the banking business. 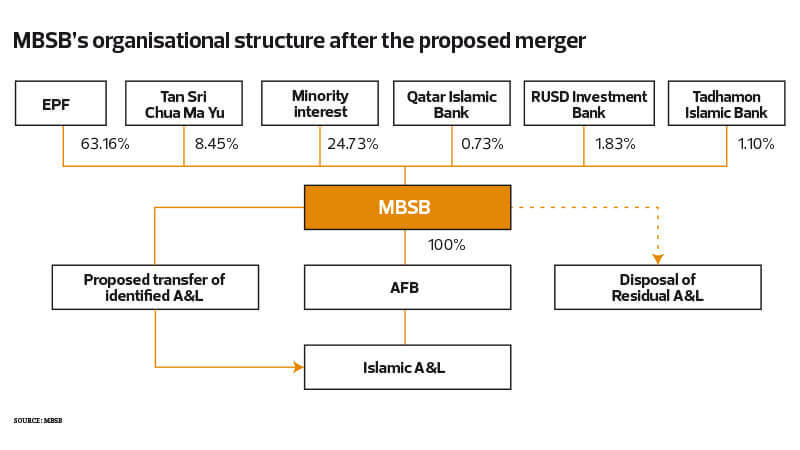 Under the deal, MBSB is expected to transfer all its Islamic assets and liabilities (A&L) to AFB. Its conventional A&L are to be converted to Islamic and subsequently transferred to AFB. Those that cannot be converted and are non-core to the group’s banking business will disposed of to third parties. According to Ahmad Zaini, the non-core assets that will be disposed of include two hotels — in Melaka and Port Dickson, Negeri Sembilan — and “one or two” property-related subsidiaries. The conversion and disposals are to be completed within three years. However, Ahmad Zaini expects the conversion to be concluded a lot earlier than that. He told analysts last week that the broad plan is to have AFB take over MBSB’s listing status “two to three years down the road”. As at June 30, only about 15% of MBSB’s RM36.06 billion gross financing book was conventional, Ahmad Zaini had told The Edge two months ago. These comprise some mortgages and corporate loans. Its personal financing business, which makes up about 63% of its financing book, is all Islamic. MBSB will not be transferring its non-performing loans/financing (NPLs) to AFB. Longer wait for Islamic status? On Legal Day One, MBSB’s banking subsidiary will be a full-fledged Islamic bank. As the holding company, MBSB will be left with the conventional assets, which are meant to be converted, and the non-core property subsidiaries that will be sold. It will also manage the winding down of the NPLs. Some industry observers point out that given this structure, from an investment standpoint, MBSB as the listed company cannot be deemed to be fully Islamic until the conversion of the conventional assets is done and AFB takes over its listed status. “MBSB is expected to obtain its full Islamic status in two to three years’ time pending the completion of this transfer consideration,” says MIDF Research. MBSB was meant to be one of only three listed shariah-compliant companies in the financial services sector. The other two are BIMB Holdings Bhd and Syarikat Takaful Malaysia Bhd. “There are Islamic funds out there hungry for finance stocks. That’s why it’s important that MBSB addresses the conventional loans in its book … it needs to be seen as a fully shariah-compliant lender,” an industry observer had previously told The Edge. Ahmad Zaini, however, says it is just a technical debate and that there should not be any question about the group being fully shariah compliant. “At MBSB, there will be zero income from the conventional assets — it will all be from Islamic. And on the subsidiary’s side, 100% of the business activities are Islamic,” he says. Going forward, there will be unique opportunities for the group to tap as an Islamic banking entity, says Ahmad Zaini. The new opportunities include trade financing and money market activities, which are capabilities that AFB currently has. “For example, in the past, I could give customers a bridging loan but for trade financing, they would have to go to other banks. Now, with our new banking platform, our customers will be better served by us being able to offer more products and services, which we could not have done in the past,” he adds. The banking entity is expected to have a similar composition to MBSB’s current business, with 70% in retail banking and 30% in corporate banking. It will solidify its presence in the property, housing and infrastructure segments. “We’re trying to put in place more aggressive mortgage programmes, particularly for affordable housing,” Ahmad Zaini explains. He says plans for digital banking are also underway, with the entity likely to initially focus on low-hanging fruit such as simple apps and solutions. “We believe the acquisition … will stimulate an upward trajectory of MBSB’s operating income. This is premised on the new banking platform of MBSB, which is now able to offer Islamic universal banking services — to both retail and wholesale banking customers — such as wealth management, foreign exchange, investment banking, debt capital management and trade finance,” says MIDF Research, which kept its “buy” call on MBSB with a target price of RM1.50. The acquisition is not expected to have a material impact on MBSB’s FY2017 earnings. Analysts say it will take time for the entity to build itself up to become a more formidable competitor in the banking industry. “We do not expect the [deal] to significantly impact the competitive landscape of the banking sector, at least in the next two to three years. This is because, following the acquisition, MBSB will need time to build up the franchise and network. For now, AFB is just a small player in the industry,” CIMB Research says in a Nov 7 report. AFB had an asset size of just RM2.6 billion as at June 30. The cash portion of the deal, at RM396.89 million, which will be internally funded, values AFB at a price-to-book value (PBV) of 1.2 times; and the shares portion, at 1.5 times. On the whole, the deal values AFB at a blended PBV of 1.3 times. While some analysts view the valuation as fair given that it falls within that of past mergers and acquisitions, CIMB Research sees it as unattractive. “The deal’s 1.3 times PBV is below the 1.86 times average for past banking M&A transactions in Malaysia (a range of between 0.9 times and 2.9 times). However, we do not regard the valuation as attractive given AFB’s much smaller net profit of only RM3.7 million in FY2016 relative to the purchase price of RM645 million,” it adds. Of AFB’s four Middle East shareholders, Qatar Islamic Bank, which is the largest with a 66.66% stake, opted for both the cash and shares options. RUSD Investment Bank Inc (16.67%) and Tadhamon International Islamic Bank (10%) both agreed to take the shares option while Financial Assets Bahrain WLL (6.67%) opted for the cash option. Upon the completion of the deal, MBSB’s largest shareholder, the Employees Provident Fund, will see its 65.56% stake diluted slightly to 63.16%, while the second largest shareholder, Tan Sri Chua Ma Yu, will see his 8.78% stake diluted to 8.45%. MBSB’s shares, which were suspended from trading last Monday pending the merger details, rose 5.4% to close at RM1.17 the next day before settling at RM1.14 on Friday.